Episode #75: ACTION COMICS #75 & SUPERMAN #75! ACTION COMICS 75 & SUPERMAN 75! 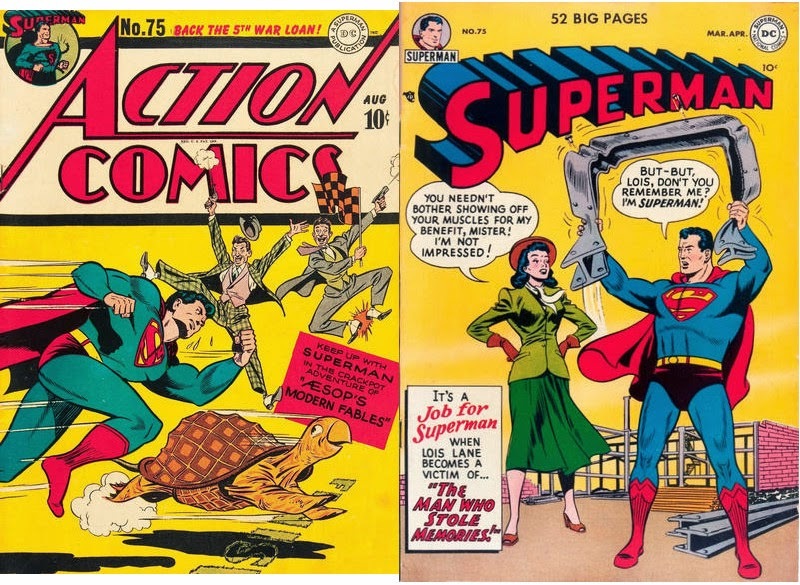 This 75th episode features the 75th issues of both ACTION COMICS and SUPERMAN from the golden age. Also highlighted are the first, 25th and 50th issues of both titles. Superman in AESOP'S MODERN FABLES, drawn by Ira Yarbrough. Hayfoot Henry in BASEBALL BARRAGE, written by Alvin Schwartz. Vigilante in BLUNDERBUSS BOOTY, drawn by Mort Meskin. Congo Bill in FRAME IN FULL, drawn by Edwin J. Smalle, Jr.
Zatara in THE STING OF DEATH, written by Gardner Fox and drawn by William F. White. THE PRANKSTER'S STAR PUPIL, written by Edmund Hamilton, pencilled by Wayne Boring and inked by Stan Kaye. SUPERMAN -- THRILL SALESMAN, written by Edmund Hamilton and drawn by Al Plastino. THE MAN WHO STOLE MEMORIES, written by William Woolfolk and drawn by Al Plastino. SUPERMAN FAN PODCAST can also be found at http://www.gcast.com/u/Billy_H80/http_supermanfanpodcast_gcast_com_rss_xml.xml , and at the internet archive at http://archive.org . Expanded show notes can be found at http://supermanfanpodcast.blogspot.com . Send e-mail to supermanfanpodcast@gmail.com . Episode #74: Happy Birthday, Gardner Fox! Gardner Fox was born on May 20, 1911 in Brooklyn, New York, and died on December 24, 1986. Because of his long and prolific career with DC Comics from the mid-1930-s to the late 1960's, he is one of the founding fathers of the comic book industry. Expanded show notes can be found at http://supermanfanpodcast.blogspot.com . Send e-mail to supermanfanpodcast@gmail.com . The theme music is PLANS IN MOTION composed by Kevin MacLeod, part of the royalty free music library found at http://incompetech.com/ . Episode #73: Happy Birthday, Marv Wolfman! Marv Wolfman was born on May 13, 1946, which in 2009 makes him 63 years old. Many happy returns of the day, Marv! He is best known for several titles, TOMB OF DRACULA, with the great penciller Gene Colan, for Marvel, and THE NEW TEEN TITANS and CRISIS ON INFINITE EARTHS for DC. This episode features his comic book career, although he has also worked in TV and animation. The featured Marv Wolfman Superman story is IF SUPERMAN DIDN'T EXIST, drawn by Gil Kane and published in ACTION COMICS #554, April 1984. It was reprinted in the trade paperback SUPERMAN IN THE EIGHTIES. Marv created or co-created many comic book characters. For the post-crisis Superman titles he created Cat Grant, Professor Hamilton, the Milton Fine Brainiac and Lex Luthor as corporate mogul. http://www.io.com/~woodward/chroma/crisis.html for a detailed look at Crisis On Infinite Earths. Expanded show notes can be found at http://supermanfanpodcast.blogspot.com . Send e-mail to supermanfanpodcast@gmail.com . The theme music is PLANS IN MOTION composed by Kevin MacLeod, part of the royalty music library found at the web site http://incompetech.com/ . Episode #72: Superman In Exile, Part II & Free Comic Book Day! 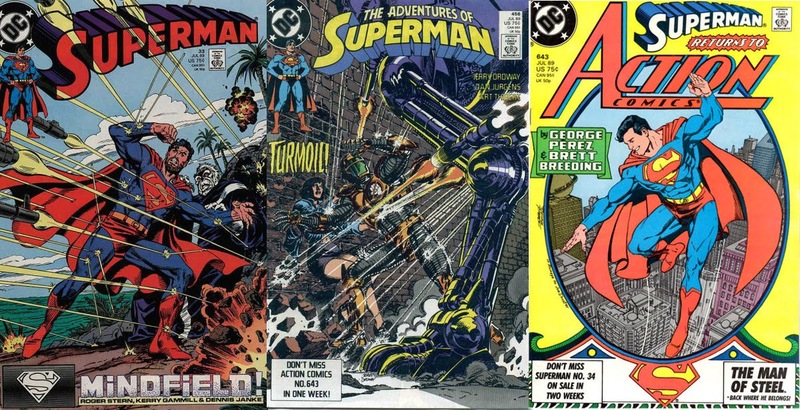 The final 3 issues of the SUPERMAN IN EXILE storyline: SUPERMAN 33, THE ADVENTURES OF SUPERMAN 456 & ACTION COMICS 643! The SUPERMAN IN EXILE issues featured in this episode are ADVENTURES OF SUPERMAN 451, SUPERMAN 29 and ADVENTURES OF SUPERMAN 452. For a full checklist of the Superman In Exile issues go to the Superman Fan Podcast blog titled SUPERMAN FAN PODCAST SPECIAL BLOG: THE SUPERMAN IN EXILE CHECKLIST!. It can be found at http://supermanfanpodcast.blogspot.com/2009/04/superman-fan-podcast-special-blog.html . I also briefly mention what I got on FREE COMIC BOOK DAY on Saturday, May 2, 2009. For a complete review of the FCBD titles I got, as well as the regular titles I bought that day, go to MY PULL LIST blog, issue #52 at: http://mypulllist.blogspot.com/2009/05/issue-52-comic-books-for-week-of.html . Expanded show notes can be found at http://supermanfanpodcast.blogspot.com. Send e-mail to supermanfanpodcast@gmail.com . The theme music for this podcast is PLANS IN MOTION composed by Kevin MacLeod, part of the royalty free music library found at http://incompetech.com . The cover art for SUPERMAN 33, ADVENTURES OF SUPERMAN 451 and ACTION COMICS 643 used here for educational purposes within the "fair use" provision of the U. S. Code: Title 17, Sec. 107. Superman and all related characters are trademark and copyright DC Comics.